…but it is huge and can be hard to know where to begin. You aren’t going to see everything in a single trip to Australia, but you can see a lot of the highlights. With a bit of planning you can put together a trip for whatever time you have that gives you a good look at Down Under. This post lists some of places to start and how many days to think about spending in each. Use this as a basis to make your perfect personalized itinerary to see Australia. I recently wrote about 6 countries for new travelers, one of which was Australia. It’s a great country to visit no matter how much travel experience you have, but it’s especially easy to navigate for those who haven’t done much traveling. You won’t have to worry about a foreign language, and there is so much to do no matter what you’re interested in. The country is almost the size of the continental US, so you can’t cover it all in one vacation, but these are some of the highlights for first time visitors. Pick a couple places and build your Australia itinerary based on how much vacation time you have. Include time to get to and from Australia, as well as transportation between locations. As Australia’s most famous city, it’s a great place to start. It’s Australia’s oldest and largest city (but not the capital), and it has plenty to offer for both city and nature lovers. Sydney Opera House – Whether you want to take a tour or just admire its beauty from the outside, this is one landmark not to be missed. My favorite time to see it was as the sun started setting. The Harbour Bridge – You’ll see the bridge near the Opera House. If you’re not scared of heights, consider doing a bridge climb tour. Circular Quay and the Harbour – The energetic port lies in between the Opera House and the Bridge. Take a boat tour or just hop on a commuter ferry for a different view of the Harbour and the city. Beaches – Escape the city for an afternoon by spending some time at any number of beaches. Royal Botanical Gardens – For a slice of nature inside the busy city, take a stroll through these gorgeous gardens. Blue Mountains – Get out into the scenic mountains and forest not far from the city. Plenty of tour operators have day tours to the Blue Mountains. Melbourne is a wonderful city to wander around in. It doesn’t have anything similar to the big iconic Opera House in Sydney, but the city has its own great vibe and lots of delicious restaurants. Consider a walking tour of Melbourne to see the highlights. Federation Square – The perfect starting point. Here you will find a tourist office as well as the Ian Potter Centre National Gallery and the Australian Centre for the Moving Image. 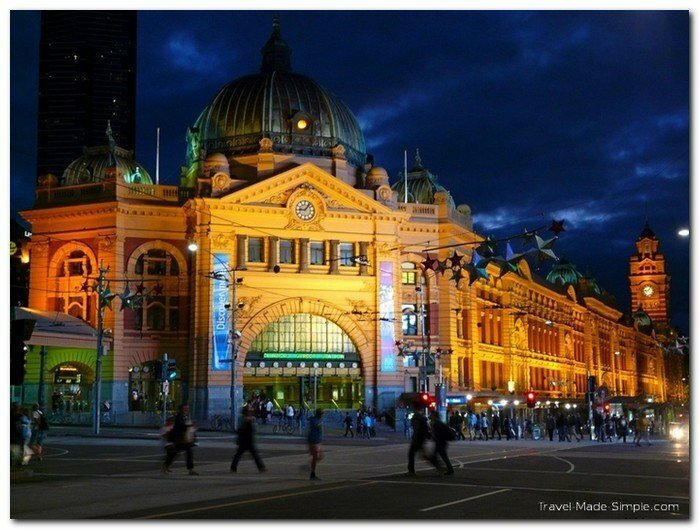 Flinders Street train station – Located across the street from Federation Square, this gorgeous building is worth a look even if you’re not taking a train anywhere. Yarra River – The river runs behind Federation Square, and it’s a nice place for a stroll. Bourke Street Pedestrian Mall – This street and the many surrounding it are the place to go for shopping. Not into shopping? Relax on a bench and watch the world go by. Chinatown – I had a hard time choosing a restaurant here because there are so many! Queen Victoria Market – Stop in here for fresh produce, meats and cheeses, or a wide variety of souvenirs. There’s also a small food court. The Great Ocean Road is a stunning stretch of coastal road that starts not far from Melbourne. You can do this as a day trip, but I highly recommend taking two days to see as much as possible. Plenty of tour operators start in Melbourne, so you don’t have to drive. I took this tour, and I really enjoyed it. 12 Apostles – This is the area’s most famous section for a reason. The view is truly amazing. London Bridge – See a section of rock jutting out into the ocean named for its bridge-like appearance. Beaches – You are on the ocean after all. There are countless beaches along the way. Stop for the scenery or a swim. Forests – Temperate rainforests in the area are great for a different look at what this region has to offer. Search for waterfalls and get a chance to see koalas. Read my full review of the Great Ocean Road tour here. Uluru is located in the remote center of the country. It’s not exactly a quick jaunt from anywhere, but it’s well worth the journey. It will take you longer to get out here, even if you fly, so this is best added to a longer itinerary. Walk around – The rock is massive. Walking around its 5.5 mile (9km) perimeter will take you approximately two hours without stopping for pictures. Please don’t climb! – Some people still do this, but it goes against the aboriginals’ law and culture, so it is very disrespectful to climb the rock. Also, it’s extremely hot and dangerous. Sunset/sunrise – The rock appears to change color during these magical times of day. Don’t miss it! Kata Tjuta (the Olgas) – This is another national park nearby that is also worth a visit. From the right spot, you can actually see some of these rocks from Uluru. BBQ dinner and stargazing – One of the best ways to end the day after exploring Uluru is to enjoy a delicious meal and admire the starlit sky. The Great Barrier Reef is another one of Australia’s iconic tourist attractions. If you enjoy scuba diving or snorkeling, this is the place for you. Since the reef stretches from just below the Tropic of Capricorn all the way up to the northern tip of Queensland, there are several good destinations for ocean fun. This is a tropical area, so you can also visit the nearby tropical rainforest. Cairns – This is one of the more popular towns for exploring the reef. 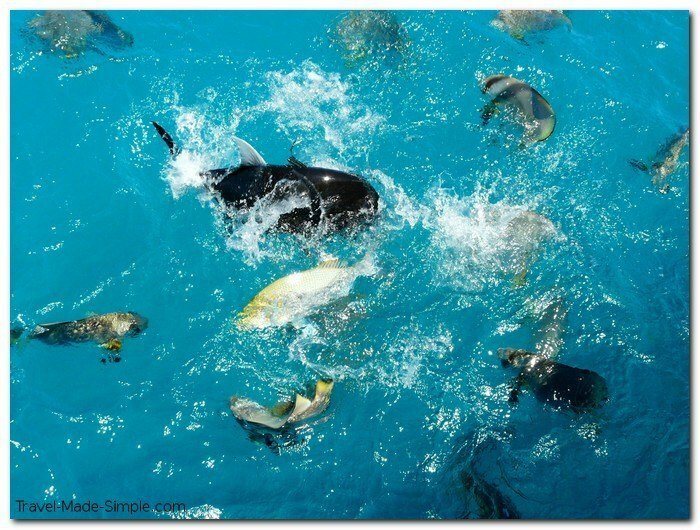 The Whitsunday Islands – These gorgeous islands are closest to the reef itself. Lady Elliot Island – Here you’ll find 19 dive sites, including shipwrecks. Cape Tribulation and Port Douglas – Great for exploring the reef and the rainforest. To get in between Melbourne and Sydney, either book a short flight (hour and a half) or you can choose a bus or train option. Going by bus or train will take anywhere from 10 to 14 hours, so be sure to add in an extra day to your itinerary to account for this. To get to Uluru, the quickest way is to book a flight into the Connelan Airport (AYQ) in the nearby town of Yulara. Direct flights are possible from Sydney (3.5 to 4 hours), but from Melbourne (4 to 6.5 hours) you’ll have to make one stop. Alternatively, fly into Alice Springs which is about a five hour drive away from Ayers Rock. How you get to the Great Barrier Reef varies greatly depending on which destination you choose. Some, like Cairns, have an airport and it’s about a 2 hour flight. Some locations do not have a local airport, so you will need to rent a car or arrange a transfer from the nearest airport. If your itinerary involves two major cities, like Sydney and Melbourne, book an open jaw flight to Australia. This way you fly from home to Sydney and then from Melbourne back home. Then you don’t have to backtrack to catch your return flight. Australia is far away from almost everywhere, so depending on where you’re traveling from, expect the journey to take anywhere from 16 to 40 hours. Follow my jet lag advice in order to minimize down time once you arrive. Read here for more about transportation in Australia. Australia is a huge country. There’s no way to see it all on even a 2 week vacation. Choosing a couple of these places will give you a taste of Australia. Don’t try to cram too much into your itinerary though. Check out this helpful Australia itinerary book for more advice on planning your trip. Here though is an idea of 2 weeks in Australia to get you started. 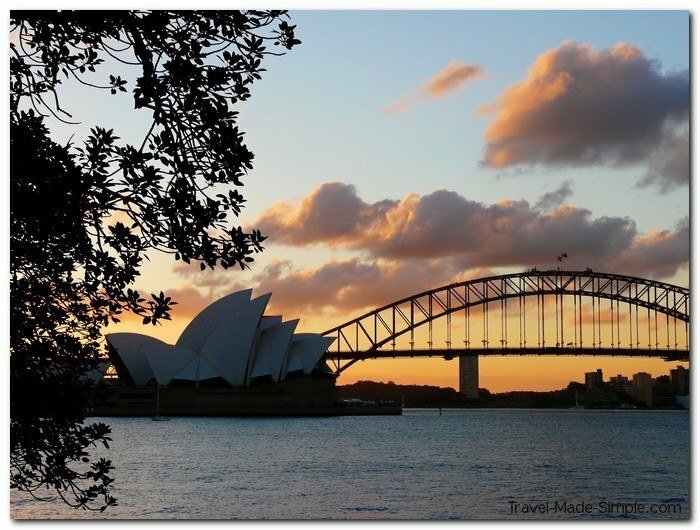 Sydney(3 days) – Explore the sights, neighborhoods, and beaches of the largest city. Melbourne(5 days) – 5 days in Melbourne seems like a lot, but it is a great base for exploring the region including the Great Ocean Road. Beyond that, Melbourne is just a hip and fun town to be in. Uluru(2 days) – Getting to and from Uluru involves flights, so it means a lot of transport to see one sight, but what a sight it is. Uluru is definitely one of Australia’s big sights and worth the transport. Cairns and the Great Barrier Reef(3 days) – Head north to the city of Cairns to explore the rainforest and take a day trip out to the reef. This is still a pretty fast trip. If you feel like you can cut out anything or add another week to your trip, seriously think about it. Also remember that Australia is huge and there is significant transport time (flights can eat half or even a whole day). Travel slowly so you’ll actually enjoy your trip and you won’t get burnt out. Even consider adding more days to what I suggested. If you haven’t traveled much, this is a great way to get your feet wet. 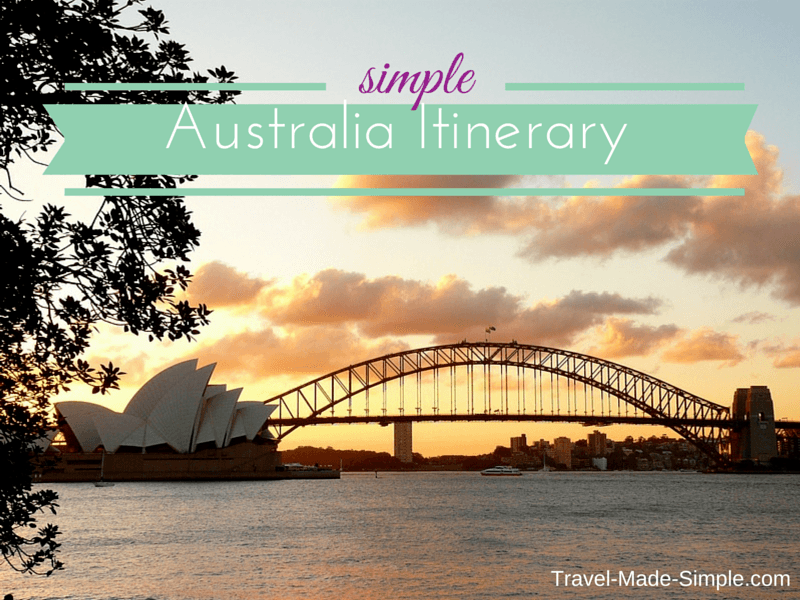 The possibilities are endless, and I certainly couldn’t include everything here, but this Australia itinerary will get you started. 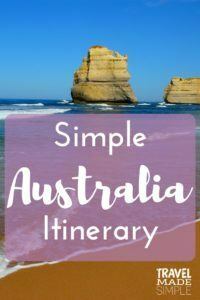 Hopefully our Australia itinerary and ideas for planning two weeks in Australia have been helpful. The following posts provide more in-depth information about Australia travel, tours in Australia, and specific cities and regions. And if you’re looking for a little inspiration, be sure to check out the books recommended below. Looking for a fully organized tour? Check out Australia tours here. Wow! Fantastic post! Very thorough and easy to use. We haven’t been to Australia yet and your daily itinerary ideas were just terrific. The pictures look so inviting as well. Thank you! A birthday surprise trip sounds awesome! Although it would kill me to not know where I’m going, but it sounds like such a great idea. Definitely let me know where you end up going, and happy birthday! We haven’t been to Australia yet, and our first trip will give us 2 weeks at the most to explore since we both work full-time. What would you recommend as your top picks if you only had 2 weeks? Also, were you concerned about box jellyfish at all while swimming? It depends on how fast you’re willing to travel and what your interests are. Sydney and Melbourne are both great cities, but you probably want to just pick one. If you’re really into snorkeling or diving, you can’t miss the Great Barrier Reef. If you like hiking, Uluru and the other nearby parks are great, it’s just farther away. If you’re willing to keep a fast pace, you could probably get away with 4 days in Sydney, 4 days in Melbourne, 2 days on the Great Ocean Road, and 2-3 days somewhere along the Reef. Your flights would be reasonably short, but you probably want to schedule really early or really late flights so you don’t waste too many daylight hours in transit. As for the box jellyfish, when I went snorkeling they gave us these thin body suit things to wear. Not as thick as a wetsuit, but enough to protect from any stings. Let me know if you have any other questions! I am planning to take my daughter on a trip to Australia. My first thought was a cruise to New Zealand and Sydney. I think we would miss the Great Barrier Reef , but do you think we’d see enough beaches animal life and scenery by cruising? Hi Robyn! I’m not sure, I’ve never done a cruise in Australia. It really depends on the destinations and shore excursions, so if you have a few cruises in mind, it’s worth digging a little deeper into what they have on offer and calling the cruise company to ask some questions. Most places along the coast, where you’d be on a cruise, would be near a beach. I imagine some shore excursions might have options to go to a zoo or something. Start with the cruise company and see what options they have and go from there. You’re right, it’s impossible to cover the whole Australia in one vacation. There are some very good tips here. I went to Melbourne years ago for a short holiday and loved it. From there we did few day trips to the Phillip Islands and to the Great Ocean Road. I definitely need to go back and explore the rest of the places you mentioned, so much to see! I’m so glad you made it to the Great Ocean Road! That’s one of my favorite parts of Australia. Definitely so much to see, and so much more of Australia I want to explore. Thanks Franca! I’d love to go to Darwin and Tasmania! There is just so much to see in Australia! That’s great Michael! Have fun, Melbourne is a great city. I hope you have time for the Great Ocean Road, it’s amazing. And enjoy the race! I’ve never been to Byron Bay, but I’ve definitely heard good things! It was so hard to stick to even this long list of places. Australia is a great country with loads to do. Thanks Chris! Some really great tips! I’ll be heading off to travel NT and QLD very soon and this is just getting me even more excited! Thanks! Thanks Laura! I hope you have a great trip, I love Australia! Thanks for sharing such wonderful knowledge. I want to travel the best of australia in 1 month. This is the limited time i have got and i wish to see the maximum of places. it will be very kind if you can help with an itinerary. Hi Anchal! Sorry for the delay, you got me right in the middle of moving from one city to another. I’ll send you an email in the next couple days! I love your article on this and it’s very helpful. My sister and I are going to travel around Australia in 1 month this coming December. Same like Anchal, we wish to see the maximum of places there. Your help with an itinerary would be highly appreciated. Thank you. A month in Australia sounds great! I think a month is enough time to hit the highlights and fill in the rest depending on your interests. So if you enjoy cities, spending a lot of time in the Outback might not be the ideal vacation for you, that type of thing. I think that’s your first step, deciding what kinds of activities and settings you enjoy the most. Then you can decide where to go based on that. Personally, I enjoyed a few days in Sydney, a few days in Melbourne, a few days seeing the Great Barrier Reef, and a few days on the Great Ocean Road. I did go see Uluru, but on your time schedule, I’d recommend a few days, not just one like I did. That way you can see the surrounding areas as well. Just remember, it’s a big country! Check out this interview I did with an Australia itinerary expert https://travel-made-simple.com/interview-australia-itinerary-expert/ which includes a link to her itinerary book, which might be helpful to you. Or if you’re interested in having me help you customize a trip, check out my consulting services here: https://travel-made-simple.com/travel-consulting/ Either way, you will have a great trip to Australia! It’s a wonderful country. Wow this is so helpful, my partner and I are planning our trip to Aus and this is a great start to our planning,! If you could share any more info with me I’d be very grateful we’re looking to go end of this year and we want to go all over with no deadline to end the trip! Thanks Corinne! Australia is such a wonderful and varied country. If you have the time and flexibility, there is so much you can do. Unfortunately I have only ever been able to go for a week or two at a time. If you truly have no deadline (though keep in mind visa restrictions) you should look into either renting a car or campervan, or buying one that you can resell at the end of your trip. Probably best to start in Sydney or Melbourne, and then you can work your way up the east coast or south and west across the south coast, cut up the center to Uluru and eventually Darwin. And really with that much time and flexibility, you’re probably better off not planning too much. Trying to stick to a planned out itinerary for more than a couple weeks gets really exhausting and stressful. Check out http://ytravelblog.com. They are from Australia and they’re currently traveling around the country (I believe in a campervan of some kind) with their 2 daughters with no end date for the trip. They’re writing about the places they’re visiting and have really great advice for the kind of trip you’re talking about. I hope this helps, but feel free to email me with any questions! I loved the post. Gave me a few pointers to plan our vacation. Truly travel made simple. I am travelling with my family to Australia and will be there for around 4 weeks from April to May. We would be stationed primarily in Sydney where my brother resides. Since i am travelling with my two small kids( aged 4 and 6) I don’t want to cramp in too many things. Would appreciate your inputs as to the must see places/ must do things there. Thanks Annette! Sounds like a good idea to not try to do too many things. If you’re going to Melbourne, a side trip to the Great Ocean Road is, in my opinion, a must do. If you have your own car there, spread it out over a few days, but if not, I’d recommend finding a tour that’s at least 2 days/1 night. I think it’s too much to do on a day trip. As for the Great Barrier Reef, there are so many options. I went to Cairns, which might be one of the less expensive options, but I’ve also heard wonderful things about the Whitsunday Islands. Cairns is closer to the reef itself. The Australia Zoo http://www.australiazoo.com.au/ in Brisbane claims to be the home of the Crocodile Hunter, and I’m sure your kids would love it. With 4 weeks you should have plenty of flexibility to decide a few days ahead of time on most things. If you have any other questions, let me know! Thanks for the wonderful post. I am planning a 4 week vacation during X’mas 2014 with my wife and little girl….What seasonal event do you recommend I cover. Also is there a 4 week trip itinerary that you have published. Could you share that with me as well? Hi Jitendra, I don’t have a specific 4 week itinerary published, but I can certainly give you some ideas. I will email you, that’ll be easier. Hello Ali: Question for you. We plan to fly from San Francisco to Honolulu in February and depart Honolulu in early March to fly to AU for a one month visit there. I’ve noted your recommendations, and very much appreciate your guidance. My main question pertains to airline arrangements. If we fly into Sydney or Melbourne from Honolulu and follow your recommendations on days to spend in different areas, just curious if best to go with a fixed air pass schedule, or to fly loose and book trips out of Sydney or Melbourne to get around to Cairns, possibly Ululu, possibly Perth. Is there a way to get an open ended air pass to enable flexibility flying city to city? Any recommendations or suggestions most appreciated. Hi Barry! Qantas has this air pass: http://www.qantas.com.au/travel/airlines/air-pass/us/en It should save you money if you’re going to book multiple flights within Australia, and you have to book in conjunction with a Qantas or American Airlines international flight to/from the US. It does look like you still have to pick your dates ahead of time, so it’s not really getting you any extra flexibility, just hopefully some cost savings. If you want to stay flexible, I don’t think this pass is a good option since change fees will add up quickly. I did a quick look at a few routes on JetStar to see what prices looked like if I pick a date just a few days out, and it wasn’t so bad depending on the route. More frequently used routes like Sydney to Cairns were less than AU$150 one way. Anything involving Uluru gets a little tricky because it looks like some routes don’t have flights every day, so you might want to nail that piece down ahead of time, plus flights in and out of Uluru can get really expensive since it’s such a popular and remote place. I personally love to travel with flexibility, and a month is a good timeframe for that. But it does come with the risk of paying more for last-minute flights. You can get direct flights to/from a lot of different cities in Australia, which does make things easier, so you don’t have to book everything in/out of Sydney or Melbourne. You can fly Perth to Uluru to Cairns, for example. And another post about Perth: https://travel-made-simple.com/things-to-do-in-perth-australia/. I could easily see 2 weeks between Sydney, Melbourne and the Great Ocean Road. Plus 4 or 5 days at Uluru and the surrounding areas. Plus a week or so along the east coast to enjoy some beach time, see the Great Barrier Reef and Brisbane. Then back to Sydney or Melbourne for your flight home. If you’re not much of a beach person, consider touring Darwin, Alice Springs and then down to Uluru for some extra time in the Outback. Remember to account for the time it takes to get from one city to the next. Flying between Sydney and Melbourne is pretty quick, but out to Uluru is several hours. I hope this helps Barry, and please feel free to email me if you have any other questions! Also in regards to flights is it something that people book seperate and not part of their booking. Hi Marco! I don’t know where you’re flying from, but you might be better off starting with Melbourne rather than Cairns just because of the flight connections. You could spend a few days in Melbourne and then the Great Ocean Road. Then from there fly to Uluru. The airport is AYQ. (The rock is pretty impressive, but it’s a long way to go. If you’re feeling like your schedule is too rushed, that would be the one to cut, simply because it takes so long to get out there and back.) Then fly to Cairns to get to Port Douglas. From there, down to Sydney for the rest of your trip. So if I were you, I’d book into Melbourne and out of Sydney (or vice versa). I personally booked my internal flights separate from my international flights when I went to Australia. There are a few airlines inside of Australia you probably wouldn’t be able to connect with your international flights, unless you plan on flying Qantas for every leg. Unfortunately the only way to determine what’s the cheapest way is to play around with different combinations on booking sites. Start by putting in every flight you want in a multi-city option on either Qantas.com or one of the other booking engines like Expedia, and then you can use that as a base price. Then see if you can save money by booking your international flights on one itinerary and your internal hops on Jetstar, Virgin Blue, Tiger, or Qantas. Keep in mind the time you will lose every time you switch cities, including time zone changes. Add at least three hours (if not more) to every flight to account for getting to the airport, being there ahead of time, and getting through once you land. Again, this is probably the biggest negative to going to Uluru. Plus, assuming you’re coming from North America, you lose a day getting to Australia just by crossing the international date line. So if you leave LAX Thursday night, you land in Melbourne Saturday morning. Make sure that’s all factored into your two weeks. I hope this helps, but feel free to email me if you have any other questions! And enjoy your trip to Australia! Thanks so much, I will be coming from Europe. First staying a few days in Hong Kong then continue to Australia. Some recommended to fly first to CNS since its further up, however the direct flight from Hong Kong is not cheap so will do Melbourne first. The Uluru is kind of wish by partner but we might drop it. The Stops Melbourne, CNS, Sydney in 2 weeks is that enough you would recon or perhaps a place like Adelaide or Canberra can be thrown into the mix. Monday fly to Sydney, plan to go to the Blue mountains to spend a day there. Also without a car, with Melbourne and some organized trip on great Ocean road be managble? Yeah, Cairns isn’t a big airport, so it doesn’t surprise me the flights aren’t great. Honestly, I think you may have too little time for the Melbourne/Great Ocean Rd part and a bit too much on the Sydney part. You’ve left yourself a day and a half in Melbourne and a day on the Great Ocean Rd, but 5 – 5 1/2 days in Sydney. Even if you book a nonstop flight from Hong Kong to Melbourne, that’s still 9+ hours just in the air. I’d add a day or two to the Melbourne/Great Ocean Rd part of your trip and subtract from Sydney so they’re closer to even on number of days. That’ll give you a chance to catch your breath when you land in Australia, and you’ll actually have time to see the city while still leaving plenty of time for Sydney and the Blue Mountains. If you leave your schedule as is, I’m sure you’ll be fine, I’m just not sure how much of Melbourne you’ll actually see. You don’t need a car, no worries about that. Sydney and Melbourne have decent public transportation. I did a 2 day Great Ocean Rd tour (stayed overnight somewhere along the way) through http://www.aroundandabout.com.au/ that I really enjoyed. Small group, the guide/owner picked us up from our hotels and drove us to various points along the way with loads of info and plenty of time for photos. There are day tours (though his company or any number of others) but they sounded rushed to me. If you really only want to do a day trip, find one that leaves early and gets back late, and just know that you’ll be exhausted by the end of it. I don’t think it’s worth renting a car and driving yourself anyway because then whoever is driving doesn’t get much chance to actually see anything. It probably works for a longer road trip when you can go slower, but for a day or two, better to take a tour and have someone else worry about the driving and logistics. I also did a day trip to the Blue Mountains through a tour company, though I arranged it at the hostel I was staying at and I don’t remember the name of the company. You can Google some companies if you want to book ahead, but Australia is prepared for tourists and if you try to set it up as soon as you get to Sydney and you’re flexible about the exact day, you should be fine. I think you have plenty to do without squeezing in Adelaide or Canberra. I haven’t been to either, but from my experience traveling in Australia, you don’t want to go too fast or try to see too many places. You really do lose a lot of time each time you change locations. And though I’ve heard good things about both places, they don’t seem to wow people the way Melbourne, Sydney and the reef do. If you do end up going to Uluru, I’d recommend putting it between Melbourne and Cairns to minimize travel time. Just booked our flights, coming into Melbourne on a Sunday and flying back 2 weeks later. For Ayers rock still kind of on the list the flights are not very cheap, return from Melbourne is cheaper than one way to CNS. For Cairns, I have read that Port Douglas is the best place to stay. Sounds great Marco! Yes, the flights to Ayers Rock do tend to be pricey. And staying out there is expensive too. One company owns all the accommodations, from the luxury resort down to the campgrounds, so even the cheap options aren’t as cheap as you’d think for what it is. That said, it is an amazing sight, so it’s a tough call. I haven’t been to Port Douglas, but I have heard really wonderful things, and I’m sure you’ll enjoy it. Have a great trip! We are going to Sydney on Nov 9 (arrive Nov 11), to pick up our daughter after her semester abroad at U of Sydney. We will leave from sydney on Nov 25. We plan to stay 4 days in Sydney, and she has pretty much picked out the sites for there. The question is what are our ‘must sees’ for the other days. My husband would like to spend 6-7 days in New Zealand (not sure north or south island..but this isn’t the place for that question ;), so that leaves us 3-4 days for one more stop in australia. we are looking at flying to the great barrier reef. We were thinking of Cairns but my daughter just heard about Whitsunday. Any thoughts? we would probably fly in from Sydney. we want to see the scenery and culture of Australia, but will not go diving and at most one time scuba. Would you recommend Whitsunday or Cairns, and with that, which area to look for a hotel in? Or would you suggest a different area of Australia? Hi Carol! Sounds like a great trip! I went to Cairns, but I’ve heard SUCH good things about the Whitsunday Islands. I think that might be the better choice. Cairns was nice, but it’s really just a jumping off point for boat trips to the reef. I feel like the Whitsundays would be a better place to stay and really enjoy, and it’s supposed to be gorgeous. I also really loved the Great Ocean Road, outside of Melbourne. My thoughts on New Zealand – See where you can get a direct flight to, and go from there. If you can get a direct flight from Australia to Queenstown, maybe do a Milford Sound cruise. (I did an overnight one and LOVED it.) Then maybe you could go up to see the glaciers. Or fly to Auckland and split your time between there and Rotorua. Just a thought! Have a great trip, and let me know if you have any other questions! This is such a lovely and informative post. I’ll be visiting Australia in March next year and have 16 full days at hand. I’ll start from Melbourne and plan to cover Sydney, Gold Coast, Great Barrier Reef, Uluru and hopefully Tasmania, if possible. Is this at all feasible or too ambitious a project? Can you suggest necessary alterations? I really think that’s way too much for 16 days. Keep in mind just how much time you’ll lose every time you go from one location to the next. You lose a half to a full day in transit. Australia is a BIG country. My suggestion is to decide on 3, 4 places tops, that are really important to you, and cut the rest. Let me know if you have more questions! Dear Ali, I really enjoyed article so much that I decided right after reading it to go Australia and I booked some flights yesterday. May I kindly ask you can you give me some tips re tours in the different areas? we are going to Sydney on the 27 of Dec (arriving in the morning) and stay in Sydney until the evening of the 30th of Dec. 15 then we will head for Cairns for 4 days. On the 4th early morning we go to Yulara and stay there for 2 days before heading to Melbourne and having 2,5 days there, where we want to go on the Great Ocean Road for one day and see Melbourne on the two others. What tour would you recommend at the Uluru and what would you recommend in Cairns?? I am travelling with my 12 year old son so it should be lots of fun for him too.. thank you so much in advance for your kind assistance!! Hi Emilie! I didn’t do too many tours while I was in Australia, but I highly recommend this one for a Great Ocean Road tour from Melbourne. I took that two day tour and loved it. Lots of great info and we saw a lot of different places along the way. The tour I took in Cairns was more aimed at 20-something backpackers, so I’m not sure it would be a good fit for a 12 year old. And I didn’t take a tour in Uluru. Start with the tourism boards for those regions and see what tours appeal to you. Try http://australia.com, http://uluru.com, http://visitcairns.com.au. 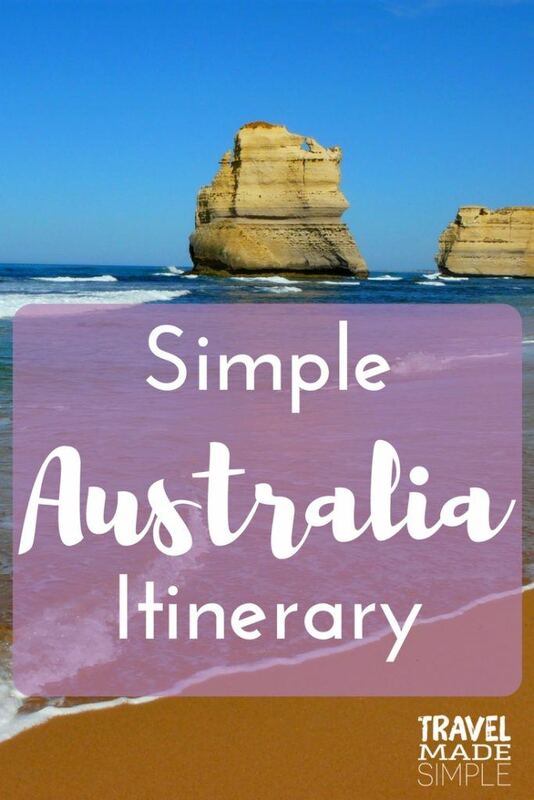 Also, check out the book Your Australia Itinerary, for which you can find more info here: https://travel-made-simple.com/interview-australia-itinerary-expert/ And if you’ve already booked hotels, get in touch with them. Often they know which tour companies are good to work with in their area and they can help set you up. This post is really helpful, very simple and straight advice. That’s what new traveler require mostly. I am planning a month long to australia in November from India. One of my friend stays in Melbourne so would fly IN & OUT from there but want to make maximum out from this 1st trip. I am more of a backpacker, who really wants to see the country through road & do as many number of locals tours. Would you please advise 1 or 2 places more for me. A month in Australia sounds great! I think it really depends on your interests. If you really enjoy the beach, you could spend the whole time going up and down the east coast and probably not get bored – Brisbane and lots of other nearby towns are a good starting point (read more here: https://travel-made-simple.com/introduction-brisbane-south-east-queensland/). If you go to Cairns, look into a company called Uncle Brian’s. I did a rain forest tour with them that was a lot of fun. I was almost 30 years old at the time and one of the oldest people on the tour, so keep that in mind. I don’t know how old you are, but if you consider yourself a backpacker, you’d probably enjoy the tour. (I took that waterfall picture in this post while on that tour.) You could consider going west from Melbourne and the Great Ocean Road towards Adelaide. There are tons of tours that go that way and stop along the way. You could explore the Outback on a tour between Darwin and Uluru. If you don’t plan on flying within Australia, or at least not too much, it might be worthwhile for you to research some of these places to decide where you might want to go, but wait until you get to Australia to talk to the tour companies and book things. They are sooooo used to travelers, so I think you’d get a better idea of what your options are for day tours and longer tours. Plus it gives you some flexibility to decide on a whim if you want to leave somewhere earlier or stay somewhere longer. Was very helpful. Will definitely follow your advise and wait for most of the bookings till i get there. Since i would anyways be staying at my friends’s place initially so would have ample time to do the bookings. We are planning a two week vacation in August 2016. Your posts have been incredibly helpful and hoping you can help. The places we really want to see in order of priority are Great Barrier Reef, Sydney, Kangaroo Island and Uluru. I know that may be one too many possible locations in 2 weeks and we really can’t extend our stay. Do you have any advice on what order and length of time to spend in each area? As far as how much time to spend in each place, it really depends on what kinds of things you enjoy doing. From your list, it seems like nature is a little more important to you than city time. But you also want to allow for some jet lag time when you first arrive. Maybe you could spend 3 days in Sydnay, 3 days in Cairns (or wherever you decide) for the Great Barrier Reef, 2 days at Uluru, and 3 days for Adelaide/Kangaroo Island. You’ll need a day to get from Uluru to Adelaide because it looks like it takes roughly 6 hours or so for the flights, and when you add in the time to get to the airport and all that, you’re really losing the whole day. That puts you at 12 days, and your remaining 2 days will partly be for travel time, and maybe add them to whichever place interests you more. Or give yourself an extra day back in Sydney before your flight home. Just make sure you’re looking at how much time you’ll *really* have in each location when booking flights. Ali, I can’t thank you enough for your advice and help. You quick response will save me hours of research. Thank you!!! Hi Ali, I am travelling to Australia for 15 days. I am planning for 5 days Sydney (including Blue Mountains), 2 days Uluru, 3 days Cairns, 3 days Melbourne (including 1 day for Great Ocean Road). I would appreciate your suggestions. Thanks! Hi Neha! That actually doesn’t sound so bad. It depends on what your interests are, if you have specific things you want to do in Sydney that make you want so much more time there vs in Melbourne. I honestly loved my 2 day Great Ocean Road tour because there’s a lot to see and it felt like a lot to squeeze into one day. But one day is better than none! In Uluru, try to do the sunset, sunrise, or even both. It’s really gorgeous! In Cairns, look into Uncle Brian’s rain forest tour. I had so much fun on that tour, though it was mostly a 20something crowd, so keep that in mind if that kind of thing is important to you. Make sure you’re accounting for travel time from one location to the next. 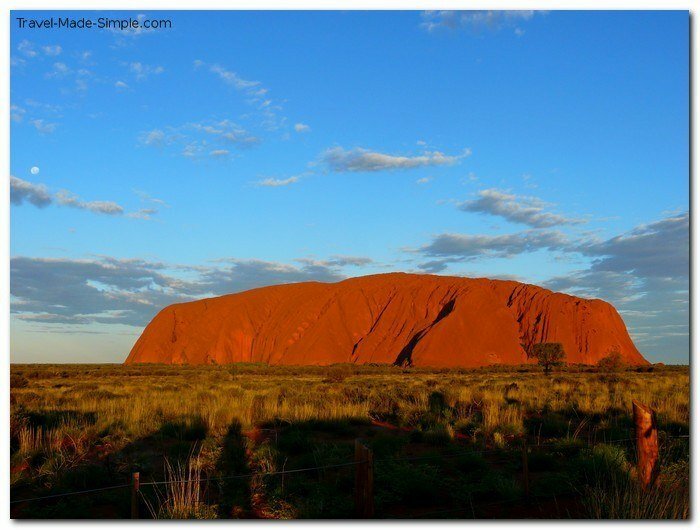 You’ll lose a few hours or even most of your day each time you change locations, plus the hours you lose because of the time zone change between Uluru and your other destinations. So just make sure you’re really getting the amount of time you want in each place. Remember that it’s not just the 2 hour (or however long) flight, it’s getting to the airport an hour or so ahead of time, getting off the plane, getting luggage, and getting to and from the airports. So a 2 hour flight really takes closer to 5 hours. Feel free to email me if you have any other questions, and enjoy your trip! Thanks so much Ali for your great suggestions. Really appreciate your help! Hi, I’ve read a lot of the questions and answers regarding a trip to Oz and they are very informative. I’m planning a trip with my husband and two boys (aged 8 & 10) at Christmas for 2 weeks. My husband has family in Melbourne so we are planning on flying into Melbourne from Delhi (hoping for a direct flight as already got to fly from Jaipur to Delhi) spend maybe 2 days, 3 nights in Melbourne, hopefully visit the Blue mountains, then drive to Sydney for New Year’s Eve. Spend 2-3 days in Sydney then I was hoping to fly up to Cairns and do some reef snorkelling and checking out the beautiful beeches. Three questions I have are…..
1. Is it risky going to Cairns and trying to do reef/beech stuff in December? I’ve discovered it’s the beginning of the wet season then. 3. Alternatively should we meander along the east coast north of Sydney and forget trying to do the reef at that time of year? Any advice appreciated as I can’t book flights until I’ve sorted the itinerary and it’s proving difficult not knowing whether to keep the reef in the agenda. Hi Jenny! You mentioned Melbourne and the Blue Mountains…the Blue Mountains are near Sydney, not Melbourne. The Great Ocean Road is near Melbourne, and I *highly* recommend it. Also, Melbourne to Sydney is a pretty long drive. With only two weeks, it might be better to fly instead of driving so you don’t lose an entire day. I don’t think it’s risky to go to the Reef in December. Rainy season doesn’t mean nonstop rain. I was there in March, which is towards the end of rainy season, and it was fine. Really humid, but fine. Check out this link for a little more info about the seasons. It sounds like it’s mostly afternoon rain or thunderstorms. That might mean going to the beach earlier in the day, but it’s the tropics, so it’s warm all year round. I think there are plenty of worthwhile places to see along the east coast: Brisbane and Gold Coast just to name a few. That said, with only 2 weeks, you don’t have a lot of time for meandering given the distances. I could see spending 3 days in Melbourne, a day or two at the Great Ocean Road, 3 days in Sydney, 3 days in Cairns, and a couple days in Brisbane, but probably best if you’re flying from one city to the next. If you’re really concerned about whether or not it’s a good time of year to see the Reef, I’d recommend contacting some tour companies or snorkeling companies and asking them what the conditions are like in December. Hello, I am trying to organise a mixed trip. our daughter is working in Perth. We plan to fly from europe to Perth arriving on Tue or Wed. Our daughter starts her two weeks holidays on the Friday. She must be back two weeks from the Sunday. My Husband will have approx 3 weeks holidays from our departure date in Ireland so he would be returning from Australia the Mon/Tues after the end of our daughters holiday. We currently hope to visit the Reef, the Rainforest area, Sydney and, if time allows, Melbourne. Could you advise us on approx numbers of days we would need in each area ? My husband will fly home from Sydney or Melbourne depending on where we are at that time. I will be staying on for a further two/three weeks in Perth with our daughter. Thank you in advance for any advice you might be able to give me. I am anxious to get flights booked but cannot fix an intinerary in my head ! Hi Deirdre! Two weeks sounds like a good amount of time. A lot of it depends on the types of activities you enjoy, but I think you could easily spread those two weeks out between Sydney, Melbourne, and someplace on the reef. You could do an even split: 4 days in Sydney, 4 days in Melbourne, 4 days up north in the rainforest area, using that as a jumping off point for the reef. There are plenty of towns along the east coast that serve as a base for trips out to the reef. I stayed in Cairns, which isn’t the prettiest, but it’s one of the more popular ones because the reef is closest to the shore. And from there, you’d have easy access to some rainforest tours. Or you could choose someplace like the Whitsunday Islands to see the reef, and go see the rainforest separately. In that case, maybe 3 days on the islands, 2 days at the rainforest, and then split the remaining days between Sydney and Melbourne. When you’re in Melbourne, I highly recommend going out to see the Great Ocean Road. I took a 2 day tour, but there are 1 day tours if you don’t want an overnight. It was my favorite part of Australia, so so gorgeous! Also, when planning your transport from one city to the next, I’d recommend booking flights either early in the morning or in the evening, that way you aren’t losing too much of your day to transportation. I hope this helps, and have a great time in Australia! Hi there.im planning for 10days visit to sydney. Blue mountain. Uluru. Great ocean road and Melbourne.im flying from kuala lumpur. So im abit confused here.where should i start. Fly in to melbourne then depart through sydney ? Anyway I plan for 2 days at sydney.Pls help as i dont have much time to visit other places and i know its going to be jam packed programe. Hi Thiru! I think flying into Melbourne and out of Sydney (or vice versa) would work well. You could spend 2-3 days in Melbourne, 1-2 days on the Great Ocean Road, then fly to Uluru for 1-2 days, then fly to Sydney for a few days plus the Blue Mountains. You won’t have much down time, but it could work. Try to book evening or early morning flights so you don’t lose much of your day when getting from one place to the next. I recommend this Great Ocean Road tour I took a few years back. It was lots of fun, and it was great to have someone else doing the driving. I also took a day tour from Sydney to the Blue Mountains, though I don’t remember who I booked that with, it was something my hotel set up for me. At Uluru, there are shuttles that will take you from the lodging area to the rock itself, and there are specific ones for sunset and sunrise, if that interests you. I hope this helps, and enjoy your trip! Hola, estoy feliz ya que iré a Australia, tengo 10 dias llego a Sydney y mi intencion es pasar por Camberra y Melbourne, y luego de leer sobre la ruta oceanica, me encantaria incluirlo. Quisiera saber sobre el transporte terrestre, lei que hay tren y buses, es factible realizar mi itinerario sin avion. Hola Stephanie! Mi espanol no es tan bueno, pero quizas puedes entenderme! Hay trenes y buses entre Sydney, Canberra, y Melbourne. Aqui esta mas informacion sobre los trenes. Tengo mas informacion sobre transportacion en Australia aqui, incluyendo enlaces por buses. Y tengo un articulo sobre Great Ocean Road aqui. Necesitas mas tiempo para viajar sin avion pero es posible, y quizas divertido! Buen viaje! Hello, I’ll be travelling from august 12th to 26th, so only 2 weeks for me too. What would you reccomend during winter? Is weather hot enough to go to beaches? Thank you! Hi! Since August is winter in Australia, the southern part of the country will most likely not be having beach weather. The northern part of the country, especially once you get above the tropic line, should be warmer though. I’d still recommend checking out Sydney and Melbourne since they’re such great cities, but if you’re looking for some serious beach time, consider heading north into Queensland for a chunk of your trip. It’s also the drier time of year, so it might be more pleasant to travel in the northern part of Queensland and see the Great Barrier Reef. How much it will cost for entire trip for 10 days from delhi, india for per person ? That’s a really hard question to answer since there are so many factors, including your exact destinations, your preferred travel style, activities you choose to do, time of year, etc. I recommend doing some searches for hotels or hostels in the cities you want to visit and see what prices are for the types of places you are comfortable staying at. Then do some research on transport options between the cities you’re visiting and activities you’re interested in doing in each place. Then do a search for restaurant prices in the cities you’re visiting to get an idea of what it would cost to eat out. And of course, look up flights from Delhi to Australia, and consider doing an open jaw flight if you’re traveling to multiple cities, for example Delhi to Sydney, and Melbourne back to Delhi. Check out my post about how to make a budget for your vacation. 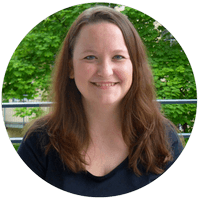 Hi Ali – Your post is so helpful. From it, my pregnant wife and I decided to narrow down to 3-4 places for 16 days in the 2nd half of November 2018. This will give us 14 days in Australia and 2 days from from and to home, San Francisco. It is our first time to Australia and our big trip before the baby arrives. By the time we leave SFO, my wife will be about 18 week pregnant so we are limited to non-strenuous high risk activities. We decided on Melbourne, Great Ocean Road, Great Barrier Reef, Sydney. We enjoy a diverse trip visiting both nature scenic places and cities. We’d like to check out the must sees, the beaches, and the animals. Our pace is medium. I am hoping you could kindly provide some tips with some questions we have. – Do you think we have enough time for the places above? Is there any locations to add or cut? – Would you recommend flying SFO-Melbourne-Cairns-Sydney-SFO or the reverse flying SFO-Sydney-Cairns-MelBourne-SFO? – Any other insights and tips are appreciated. Hi, sorry for the late reply, I was traveling in national parks with hardly any internet access. I think 14 days sounds great for what you’re planning. That gives you a decent amount of time in each location. I’m not sure if snorkeling is something your wife can handle while pregnant, but if so, there are tons of snorkeling options for the Great Barrier Reef. If not, you can probably still do a boat trip. I loved the Great Ocean Road, definitely a must! I’d recommend doing a tour so neither of you has to worry about missing the beauty while driving. I did a 2 day/1 night tour which felt more relaxed than a one day tour, but see what fits with your schedule. As for the flights, I don’t think it matters which order you do, I’d base it on price. See if it makes a difference if you book the whole thing together or if you split it out and book the international flights separate from the domestic ones. You might find a big difference between the two ways. For domestic Australia flights, check Qantas, Jetstar, Virgin Australia, and TigerAir Australia. I stumbled across your website through this article and its great! I will either go to Sydney and Melbourne first and leave from either. I am thinking Sydney (Monday Oct 29th – Saturday Nov 3rd ~ 5-6 days) with a day trip to Blue Mountain , Beach, surroundings. Fly to Melbourne (Nov 3rd/4th – Nov 8th ~ 5-6 days). Soak up the city and do the Great ocean round sound good and I clicked on your link and was looking for something like 3d2n (with the Grapplian National Park, or Philip Island) tour back to Melbourne. How does this sound? Do you have any recommendations on other cool things to do to fill the days? I am a solo traveler, male mid 30s and interested in hiking, snorkeling, nightlife, meeting people, don’t mind staying in shared airbnb, hostels, couchsurf. Hi Felix! I think your plan sounds great! You have a good amount of destinations on your list to see the cities as well as some of the surrounding areas, and I think you’ll really enjoy it. I didn’t go snorkeling near Sydney or Melbourne (I went from Cairns to the Great Barrier Reef) so I don’t know what it’s like in those areas. But if you’re staying at a hostel, their front desk should be able to hook you up with info about that. Hostels would also be a great way to meet other travelers and find out about nightlife. Both cities have lots of options, but I think it’s easier to find out once you’re there since that kind of thing can change quickly. I think you can do some good hiking in the Blue Mountains and Grampians National Park, but check with tour operators about the level of hiking to see if it fits with what you’re interested in. Thank you for taking the time to respond back! 1) For my SYD-MEL leg, I think instead, I can take an overnight train to break up from having to travel by AIR and for last minute bookings. 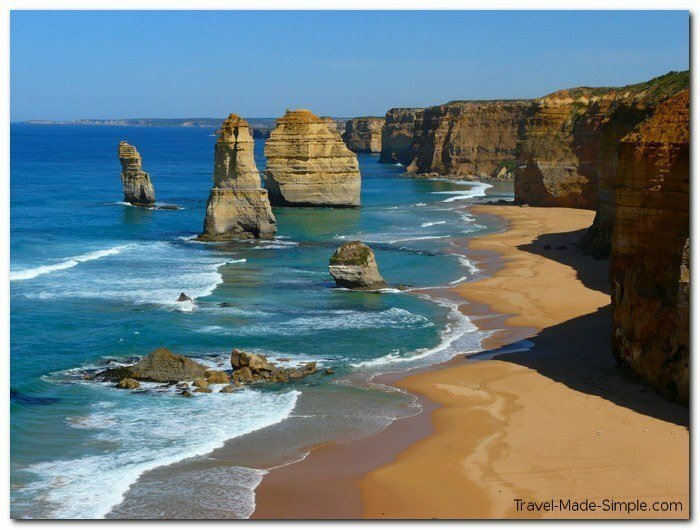 2) For MEL, I saw Bunyip Tours 3-Day Great Ocean Road and Grampians Tour from Melbourne as per 3-Day Great Ocean Road and Grampians Tour from Melbourne and it seems like this one is limited to 24 people and sounds pretty good. If you have any other Melbourne tour recommendations, and/or ways to do Ocean Road with/without Grampians, that sounds good too. You are right, with Hostels, could possibly get more information on other possible tours, and maybe find other ways to trek out instead of following some of these larger tour groups. An overnight train could definitely be a good option since it’ll be both your transport and your lodging that night. And yes, there are lots of day trip options from Sydney. I usually check Viator since they list tours from so many different operators, check out a listing of day tours here. And then you can click “multi-day tours” on the left side to see some overnight options. For the Great Ocean Road, I took this tour and really enjoyed it. It was 2 days/1 night, and it was a small group. I agree with you, definitely more enjoyable with fewer people. Hi Ali, we stumbled across this website and have read a number of your great responses to people. We are hoping you would share some of your insight with us. We are from Toronto / Canada and we are looking at booking a cruise that would leave from Sydney, travel south to Melbourne, stop at Hobart then head to New Zealand. Its a 14 day cruise. At the moment we are thinking of heading back to Canada from New Zealand the day we dock or should we consider staying a couple of days ? The time frame we are looking at is October / November 2019. That leaves us with lots of time to build an itinerary and to try to see as much as we can out of our trip. We have currently planned to arrive 5-6 days ahead of our cruise departure date in Sydney. Any ideas ideals , tips, suggest etc would be greatly appreciated. Looking forward to hearing from you. Hi Brian! Wow, that’s a tough one. 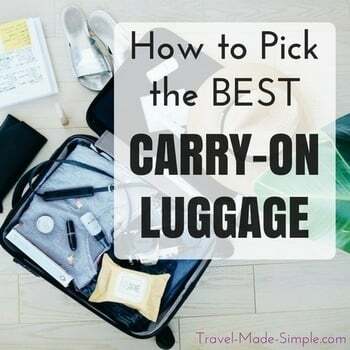 I think it depends on where you’re going on your cruise and where else you might want to see that isn’t included on your cruise. New Zealand is fantastic and certainly has more to offer than you could ever see in one visit. At the very least, I think it’s smart to stay at least one night after the cruise ends so you don’t have to worry about delays causing problems with your flight. And if you have the time, why not spend a few more days in New Zealand! Take a look at the stops included on the cruise and compare with what else there is to do in NZ (Auckland, Rotorua, Wellington, Queenstown, Milford Sound, glaciers…..just to list a few!) and make your decision from there. Some of this also depends on what types of activities you like and how far you’re willing to travel from the end point of the cruise. Hi Ali – some really great suggestions and based on your post we are tailoring our 2 week trip in December. We are travelling with 2 kids (5, 2 yr old) so wanted to just check on below. 2 days on Ocean road (you are raving about the tour, but anxious that it is around $160 pp – are kids discounted? because spending $700+ sounds like a lot. Would rental car be better, understanding that me (the driver) won’t get to enjoy it as much but also car gives flexibility with kids. 3.5 days in Cairns (flying to Cairns from Mel) and barrier reef – question though – how to cover this with 2 small kids? any recommendations? and is this a lot of days? 3.5 days in Sydney – need some beach time as this would be where we would look to slow down. Really wanted to somehow squeeze Brisbane (gold coast) between Cairns and Sydney but not sure if possible? Hi Mobeen! I did love that Great Ocean Road tour, but I think you’re right, with that many people, especially with kids, you might be better off renting a car and doing it on your own. With two days, I think you’ll have enough time to make lots of stops so you, as the driver, can also enjoy the views. Just make sure you’re comfortable driving on the opposite side of the car and opposite side of the road (if you’re from somewhere that drives on the right!). I think that would be cheaper for your group, and with young kids, that flexibility is probably very important. I do think 3.5 days might be a bit much for Cairns if your main objective is the Great Barrier Reef. There are boat tours you can take from Cairns, but most of them are a handful of hours, so I’m not sure what else you’d do with the other days. I did a rain forest tour one day, but it wasn’t really aimed at families, most in the group were in their 20s and a few 30s. Unfortunately I’m not the best person for advice on travel with kids because I don’t have any, but I’d suggest taking a look at the Australia tourism site for some ideas. I also recommend checking out this post and this post from Australian travel bloggers I know. Those posts talk about what they did in Cairns, especially with their kids, and a bunch of options for Great Barrier Reef tours. Also, if you cut a couple of days from Cairns, you could probably squeeze in that time in Brisbane. Might be a little tight, but doable. Plus the Australia Zoo is only an hour from Brisbane and I think that would be fantastic for your kids! I hope this helps! Thanks Ali! those links to the great barrier are helpful especially with kids the same age :). We keep going back and forth on can we do this trip (Australia) with kids. We are generally pretty adventurous with kids but this would be the furthest we have gone from the US. I like your advise on Australia Zoo – after all the trip is also for the kids ;). Thanks again for your help. One question – which would be a better itinerary – SYD > Queesntown (South Island) > Mel and Great Ocean Road or SYD > Brisbane > Cairns (great barrier reef) > Mel and Great ocean road for a 15 day trip? I am torn because I know it’s not easy to come from US to Aus/NZ so a separate trip to NZ would be tough, but so hard to come to Australia and not see the great barrier reef – thanks a lot again! Hi Ali, our cruise starts in Sydney from there we head down to Melbourne, across toMilford, Doubtful Sound, Dusky Sound, Dunedin, Wellington, Picton, we are in Tauranga for 2 days and the cruise ends in Auckland. Its a 12 day cruise and we have taken 3 weeks of vacation plus or minus a day. Initially we had thought of arriving a few days earlier in Sydney before the start of the cruise and just staying one day after the cruise in New Zealand. However, after reading your reply we are re-thinking things. Travelling this far and not seeing a lot of Sydney and New Zealand would be crazy on our part. I watched a TV show last night documenting a couple of different train excursions in New Zealand offered by Kiwi Rail. This was quite appealing. It appears Kiwi Rail offers a number of different excursions with various routes and I’m sure there are other companies offering the same. We have not booked our flights yet so arrival and departures destinations and dates are flexible. I should mention we are in mid to late 50’s and are not into hiking. Bus and or train excursions are more our style. Day trips are preferred returning to the location where we started. Looking forward to hearing more from you. Hi Brian! I think if you have the time and money to stay a little longer and see more of NZ, you won’t regret it. It’s a gorgeous country. We didn’t do any hiking while we were there either, still plenty to do. My husband and I did a scenic train from Dunedin that was really great, though I’m not sure if you’ll have time for that if you’re going to Dunedin while on your tour. The Kiwi Rail stuff sounds good, we were supposed to do one on the south island that started near the glaciers and went to Christchurch, but we had to cancel at the last minute, I’d definitely look at that train. I also took a train from Wellington to Auckland, but that’s a 12 hour day, so might not be ideal. If your trip ends in Auckland, you could go to Rotorua (nothing to do with trains) which is really interesting. Or you could fly back down to the south island to see more things there, but it your outbound flight is from Auckland and you don’t have tons of time, it might be too much back and forth. You could also stay in Auckland and take some day trips to nearby islands and explore a little further north of the city. I really liked Auckland, it just isn’t what most people imagine when they think of NZ because it’s a city and most people think about all the nature stuff. What you do all depends on which of those train routes sound good, how long they are, and how they fit in with the actual destinations you want to see. Sounds like a lot of really great places on your tour. I think Milford Sound was one of my absolute favorites, so it’s really cool you’re getting to see that one and a couple others. I think your tour is really hitting the highlights of the country, except for maybe Roturua, doesn’t sound like that’s included. So anything you do after the tour is bonus! Hi Pauline! I usually recommend G Adventures and Intrepid for organized tours, but you might want to check with them about the age groups that normally sign up for their Australia tours to see if you’d be comfortable. Definitely look at the “nicer” tours they offer, like the classic or National Geographic ones from G Adventures, or the comfort or original ones from Intrepid Travel. I’d also recommend looking at Peregrine Adventures. They are owned by Intrepid but are a bit more premium (therefore less of the 20something backpackers) and they are more active tours than most companies that aim at people your age. You could also try Tauck or Abercrombie & Kent, but I don’t know much about them. I hope this helps! Hi Lynn! Unfortunately I haven’t been to Canberra, so I can’t comment on that. As for the Great Barrier Reef, if you don’t want to go snorkeling or do a boat trip, you could just enjoy the beaches, or if you’re willing to splurge a little, there are scenic flights and helicopter tours that could be really fun. 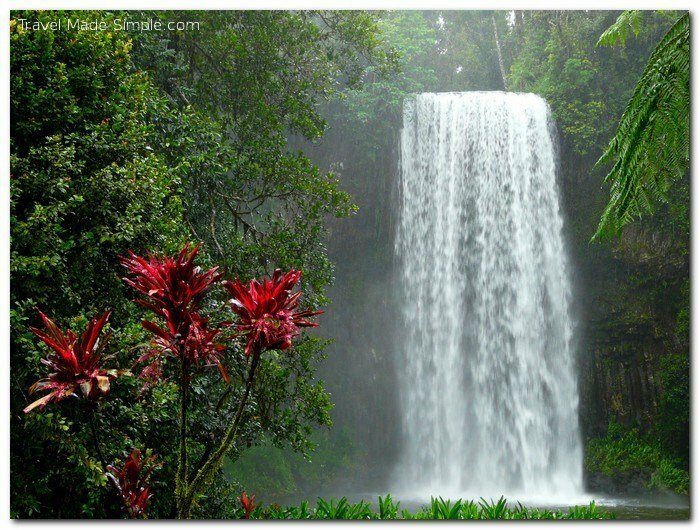 Or in some places you could do rain forest tours or something like that. I like to know some information taking the train from Sydney Australia to Perth Australia and things to do in between be like a 10 to 14 day trip I can get some information on that I really appreciate it . Hi Jeffrey! Those train journeys do look amazing, don’t they?! Check out Great Southern Rail, specifically the Indian Pacific line to go from Sydney to Perth. They can book the train ticket or even a full holiday package. You might have to contact them to customize something to allow you to get off the train for a few days here and there in the middle instead of going the whole way through in one go.